Special Offers and Fun Stuff! ﻿We have lots of fun, specials, games, and even drawings with PRIZES at times! Check back frequently to see what we are planning! Looking for a Local Career? The RED SHED is now OPEN!! What? Yes, it really, really is! Come check it out! We are still stocking and getting it nice and full of Unique Gifts and Amazing Stuff! 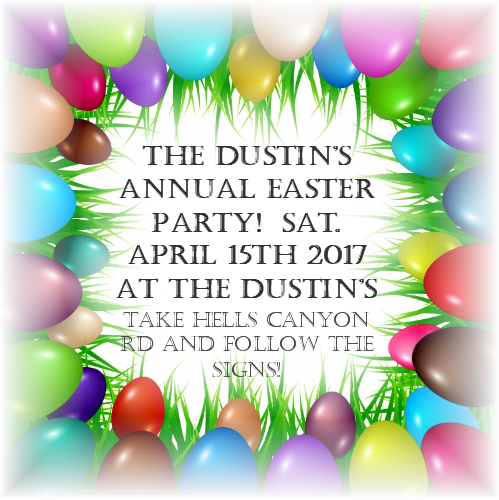 Dustin's 24th Annual Community Easter Egg Hunt and Party this month! Saturday, April 15th from 11am-1:30pm! All are Welcome! Bring a Chair! This is a POTLUCK, we provide the meat. Our Family Hides over 3000 "eggs", for each "egg" that is found, the Dustin's will "buy" back the "egg" with a Dustin Buck. Then we have an AUCTION for prizes!! So fun! We are accepting your loyalty cards for the rest of the year! Don't Forget to Claim your FREE Prize!